Once upon a time, a green aphid lived on a plant somewhere. Like most of her kind, this particular green aphid didn’t have wings so her whole life was going to be spent on this one plant, sucking away at the plant’s sweet sap. You might be quite jealous of this aphid’s life, since for an aphid a plant’s sap really is an Exceptional Confection and she spends her time doing nothing but drinking it. But her life was harder than you might imagine, at the moment she was pregnant and her one goal in life was to make sure her babies would have a safe life here on this plant. This was long before gardeners came in to the world with pyrethrum and soap spray, but she had plenty of other enemies that could make life very hard for her and her babies. The scariest of all of the aphid’s enemies were the wasps. The wasps would fly from plant to plant, smelling the air with their manically twitching antennae and searching for little green bodies with their eyes. This was very bad for the aphids, because theses wasps, just like the Ichneumon you already know about, would like nothing better than to use an aphid’s body as an incubator for the their own babies. And here comes the magic bit of our story. Our aphid wasn’t feeling very well, she was infected by some fungus or other which was spreading through her body. You know that when you feel ill that you get hotter and you might swell up, and that’s because you body is fighting back against your illness. The aphid’s body was fighting back too, breaking up the fungus cells and stopping their spread. The aphid didn’t know that her body was fighting fungi, all she knew was that she was starting to feel better, but something amazing was happening inside here. All those broken up fungal cells in her body had left their genes floating around, and one of those genes found its way into one of the aphid’s babies. A few weeks later the aphid was feeling much better, and it was time for her to give birth to her babies. Can you imagine her surprise when one of her babies wasn’t green, like every other aphid that had ever existed until now, but was bright pink! She was staggered, but she always called her pink baby her Best Beloved and she never cared for her less than her green babies. And when the wasps came, with their twitching antennae and their giant scanning eyes, they always missed the pink bodied aphid. So the pink bodied aphid grew up and had pink bodied babies, and they got missed by the twitching, scanning wasps too so they had even more babies. So now, all these years after our aphid lived on her plant somewhere every pink aphid in the world can thank her, and her fungal infection, for their lovely colour. The pea aphid, Acyrthosiphon pisum, has become something on an unlikely model organism recently, and has even had its genome sequenced. Nancy Moran and Tyler Jarvick realised that the release of the pea aphid genome data was their chance to work out how the aphid got its caratenoids. They searched for genes similar to those that make up the caratenoid production pathway in plants, fungi and bacteria in the aphid genome and found some. 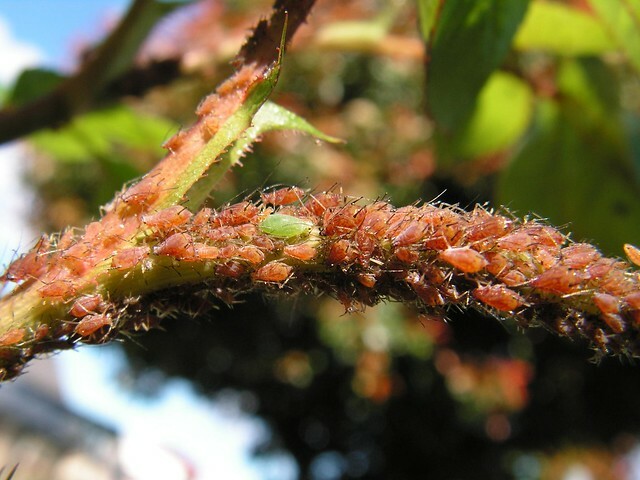 Even more excitingly, there were able to relate the aphid genes to their relatives across the biological world and conclude that the genes of the aphid catatenoid pathway are most closley related to fungal genes – the aphids got their pink colouration from a fungus genome. The transfer of genes from one organism to another outside of the traditional parent-offspring relationship is called horizontal gene transfer. In recent years it’s become increasingly obvious that single celled organisms have been swapping genes in this way since life began, but the aphid case is among the first times horizontal gene transfer has been confirmed in animals. I should say, my little tale up there is a just so story in more ways that one. We really don’t know how an aphid acquired fungal genes. Perhaps it was an infective fungus broken down an immune response, maybe it was raw RNA reverse transcribed into the aphid’s genome or maybe there was a bacterial conduit. Wild aphid populations have a lot of symbiotic bacteria which can help them adapt to particular host plants and environments, perhaps in the past they had another that used fungal genes to change the aphid’s colour and those genes have since migrated to the aphid’s own genome. I think I had some vague theory floating through my mind about the aphids having protective colouration: pink in spring when the rose stems are a fresh reddish colour, and green later on when the stems are harder. The story about the fungus is much more interesting. I spent a happy 10 minutes or so crushing pink aphids with my finger tips earlier today: enough to discourage them a little without resorting to sprays. A last thought: I enjoy these Sunday Spinelessness posts very much. Many thanks for writing them. Thanks for your lovely comment Deborah, especially on post in which I did something as stupid as trying to write my own just so story! There are probably a lot of pressures underlying the maintaince of both red and green genes in lots of different aphid species. In the pea aphid it’s said to be about predators, ladybirds (which for all their cuteness are ferociousness carnivores) like red ones and the parasitoid wasps like the green ones. 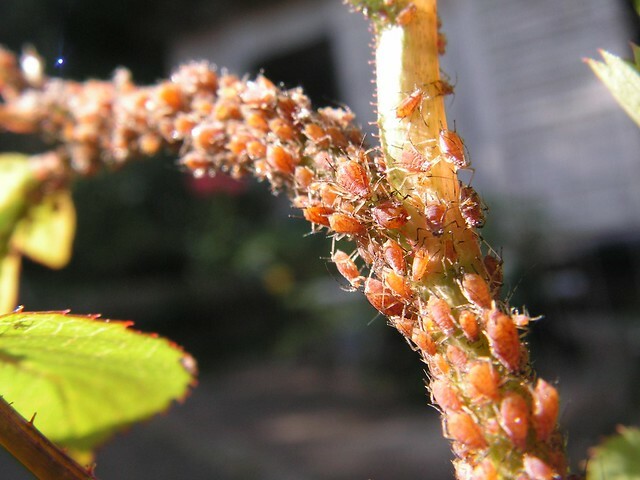 But aphids on roses are usually either the rose aphid (which makes sense) or the potato aphid (not quite as much sense), and these species might well have other selective pressure like you mention. I read the aphid-carotene story before, but never as a Just-so story, so props to you! I have a question though: I always thought that the pea aphid is one of the green varieties (hence the name), so how did Moran and colleagues find the carotene pathway genes? And if they indeed found multiple genes associated with making carotene, doesn’t this hint at prolonged exposure (e.g. symbiotic bacteria) to organisms capable of carotene synthesis? btw, I think you forgot the link to the paper itself, might be useful to add? The aphid is one of the species that has a stable polymorphism, so the red and the green forms have been maintained for a long time presumably because of some sort of balancing selection. I should have made it more clear in the post, but the red and the green forms each have some of the carotene pathway genes, the green ones just have a whacking great deletion the one that makes one of the red ones (torulene). It seems like they got their genes in one go, with one set of genes that has since become duplicated and become ‘insect-ish’ (longer introns etc).